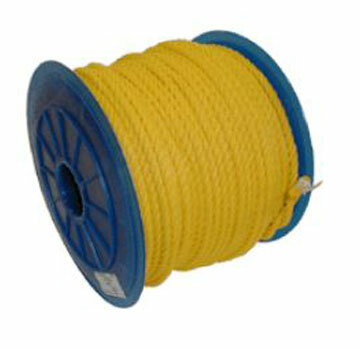 PRODUCT: 1/4" x 600' 3-Strand Twisted Monofilament Yellow Polypropylene Rope, 1250 lb. Break Strength. Price/Each. DESCRIPTION: Twisted Polypropylene Rope is premium grade, U.V. stabilized polypropylene fiber, economical, lightweight, floats, rot proof, resists oil, water, gasoline and most chemicals. Applications: tie down, tent, guy rope, utility rope, safety rope, barrier rope and much more. Lengths: 100 to 1200 feet. WARNINGS: Knots reduce the strength of the rope up to 50%, splicing is preferable. Chemicals will cause it to deteriorate. Do not use this product for overhead lifting, support of human weight or athletic equipment, or other situations where personal safety or valuable property can be endangered. The working loads shown should never be exceeded. Shock (stress, jerk) conditions can reduce working loads by as much as 33%. Never stand in line with rope under tension; such rope, particularly nylon rope, may recoil (snap back). Never use this product to secure large flat surfaces or objects. All ropes should be replaced if signs of wear, such as broken fibers are apparent. Misuse can result in serious injury or death.